Hello, The world in the Mailbox.. what is this.. well have a look at http://www.geocities.com/coversmoderator/ and you will find out..
An idea from a group of collectors in Portugal who started a group where people could exchange stamped covers between each other. This initiative had a good acceptance in Portugal so they decided to try to make it global. Do have a look at the web site and if you are interested then join up. I have and am looking forward to receiving and creating a cover. and just a quick reminder.....Christmas competition closes in 4 weeks.. see http://www.cddstamps.com fun to read the questions, and maybe even educational as well.. go on, have a look and try.. and remenber your entry, even if it doesn't win, will help some children somewhere as I use the stamps from the letters you send me in my Childrens Corner packets. worth a visit me thinks if you are interested in British Commonwealth and I have to say, Chris is a member of the IPDA (in fact a past Director) so you know you can deal with him with confidence. I have bought from these people and have been very impressed with their service. I also receive the newsletter / new listings / new covers available brochure they send out and it is worth a read even if you dont want to buy anything. Do have a look, especially if you collect covers and any specialist types of covers. In fact one or two of the covers I have shown you over the past year will have come from Buckinghams. I have enjoyed reading the entries sent so far and especially the stamps you have used on the letters to me.. I am sure there will be many happy children when they finally get resent to requests from my Childrens Corner emails and letters. So thank you for entering. 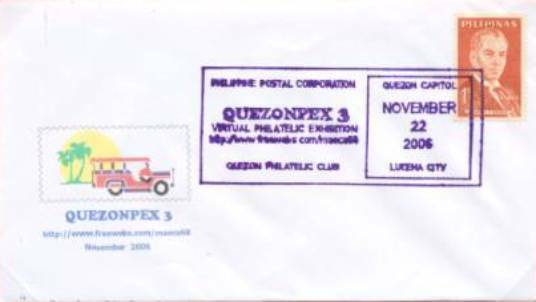 I have written about this before but just wanted to remind you again - today was the first official day of the virtual philatelic exhibit, QUEZONPEX 3. Do have a look.. it is really quite something. This is the FDC that was issued for the exhibit. Rather nice. Notice the little vehicle to the left, this is a Jeepney - a common public utility vehicle in the Philippines known for its sturdiness and colorful designs, it also shows the Coconut tree - the main crop of Quezon Province, popularly known as the tree of life. Enjoy the exhibit, and hey… maybe think about an exhibit you could put together.. all the advice you need is there on the web site. Tonight a piece by Roy Simpson, Machin Man. As informative and educational as ever. When surfing eBay for potential bargains, I always buy my stamps in multiples. MV Coils are a particular favourite of mine. You may ask why? Recently I purchased a small collection of multi value coils for just a few pounds, amongst them where 3 that are quite rare. These were early 5p Multi value Machin coils 1 x 2p + 2 x ?p + 2 x 1p on Original Coated paper with gum Arabic. Whats so special about that? Well, the answer is "know what to look for".. Sometimes the seller may not realise what they are offering, and in job lots it is possible to pick up these rare items for peanuts. These coils with gum arabic and with a silicone coating carry a very large premium over the norm and are catalogued at a staggering £250.00 per coil. 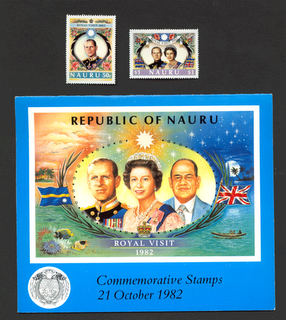 In 1972, by order of Royal Mail, certain stamps from this issue were experimented on by the printers , thus they have a silcone coating over the printed image. Gum Arabic was a problem for Royal Mail, not only did it have a tendancy to curl, stamps often stuck together. 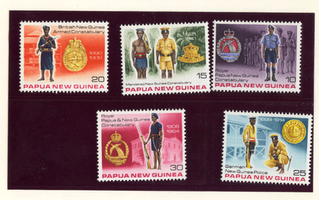 The silicone was introduced in an attempt to stop stamps sticking together, this was a problem for Royal Mail as it often happened during humid , or wet conditions whilst stamps were stored in the vending machines. After a six month trial it was found that the silicone coating did not solve the problem completely so the experiment continued, with a change of paper to Fluor Coated / Gum Arabic, these coils with FCP are not rare as stamps from the original trial as they ran for approx 2 years up to 1974 when, the gum was changed to PVA Dextrin . With the introduction of PVA Dextrin the problem seemed to be cured. Hello, look what I got in the mail today.. quite nice, as I do like these stamps.. I wrote about them a few weeks back.. and from Honolulu.. Sadly the post offices in either both the US and / or Australia bent the corner of the envelope although stamps are ok... pity about the franking from the US.. but better than often seen.. all told I am pleased to have got them.. Many of you will see thousands of these no doubt.. but then again many of you won't see them at all so I hope you enjoy seeing these. And if anyone wants to send me scans - or letters even :-) with the Christmas stamps from their country I would be really please to see them and show them to all my readers. 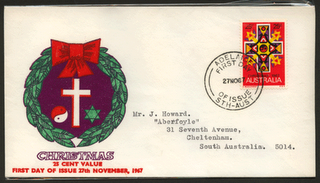 And if I send you something I do include our Australia Christmas issue. A nice addition to your collection maybe. I also went to my PO Box today and found a copy of the Royal Mail ( GB) Collection booklet for 2006. a rather nice publication. Have you been sent a copy I wonder. If you dont subscribe to the Royal mail issues I doubt you will see one.. and to be honest I am keeping Royal Mail items as "collector" item and research material for future years. A reasonably simple yet comprehensive guide to the isseus of 2006.... and were there a few of them.. awesome total cost if one was to buy one of everything advertised.. would have me broke that is for usre. Talking about being broke... I still have a few special packets left.. and I am sending extra FDCs so check out http://www.cddstamps.com of you want some extra stamps and FDCs for Christmas presents. Hello everyone.. sorry for no blog these past few days.. time just seems to fly by..
nice me thinks.. notice they have no perforations.. 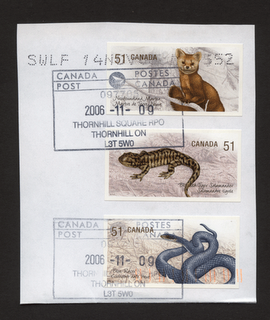 I would normally add these to my Childrens Corner box but thought I'd give them away.. first email telling me the three creatures.... email me at cddstamps@gmail.com Interesting postmarking..... note the Canada postmark and the Australian lettering at the top SWLF.... not often this clean I should add. Also to let you know I have a few of my special offers still for sale.. they are going slowly.. which surprises me.. oh well.. please have a look at http://www.cddstamps.com ....... get a packet for Christmas and give to a friend.. I always include good quality and some extras.. sorry for sales pitch but all extra funds helps ne with my Christmas card mailings... I wrote about a few special only available on the blog.. a few weeks ago.. two packets left... steal at US $5.. email me or read the old postings. 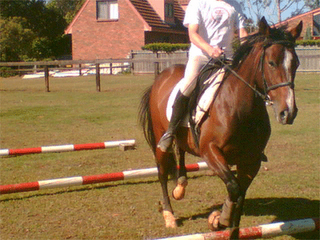 So what else have I been up to.. well... glad you asked... riding is the answer,, am working a young horse.. won't bore you with picture of me hee hee but hope you like the horse..
hey, a good friend took the picture and topped me !!!!!!!!! probably best eh!!!!!! So, many thanks to Eric from France.. 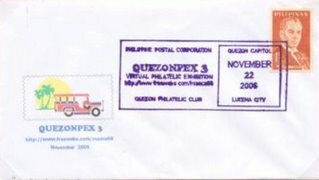 I hope you know of him and his blog .. http://my-philately.blogspot.com/ if not have a look... very good ... and I don't say this just because he sent me this cover. 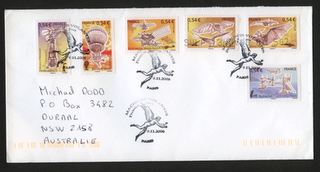 You can see the M/S of these stamps- as issued by the French Post Office on his blog from a few days ago. This cover goes into my flight collection. and why do you think it would be of some interest I know that is a bit vague but there is something special about it.. any ideas... I think I might just find a few nice Austarlia FDCs for the 4th email cddstamps@gmail.com with something close to the correct answer. And tomorrow I may show you a web site that I think you will really enjoy, and on which you will find the answers. Last nights Christmas cover was won by Baiju from India, he was the third email.. sorry for the others of you who sent in replies.. luck of the email system eh!!!!!!!!!! Hello everyone, just a short piece tonight.. there is plenty for you to read in last few postings eh!!! I found this cover today, rather nice I think.. it is in plastic wrapping so in lovely condition. It is tonights prize if you are the third email to me at cddstamps@gmail.com with the correct answer to this question: there is controvesy, so it is said in a Japanese newspaper, over the design of the Christmas stamps from which country . It seems the the postal authority is having to defend the design of the stamps for not being religious enough. Hello, well thank you all for your emails in follow up to my piece last night.... you all know so much.. and I learn so much.. and isn't that something that is so wonderful about stamp collecting.. Some other interesting birthdays this past week I thought I'd share with you, and many thanks to Jill for this information............There was some publicity around this week for Joan Sutherland, celebrating her 80th birthday on 7th November (Cup Day). 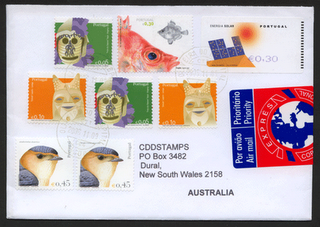 Australia Post finally recognised her as an Australian Legend in 2004 with a couple of stamps. Pierrette Alarie, a Canadian soprano, celebrated her birthday on November 9th. 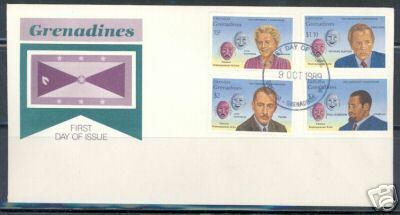 She and her late husband (Leopold Simeneau) appeared on one of Canada's recent opera stamps, issued on October 17th. November 12th is the birthday of Grace Kelly and Nadia Comaneci, both of whom have appeared on several stamps. Mongolia SG 1005 (1976) shows Nadia Comaneci. Of course Grace first appeared on stamps when she married Prince Ranier of Monaco in 1956. The US brought out an attractive stamp of her in 1993 (SG 2778). How interesting can stamp collecting be I ask myself.. yes there is more to life than just my Downey Heads . And don't forget the Christmas competition... it is fun just to read.. but there will be 12 prizes, so go for it... and even if you don't win, know that your letter / entry and the stamps on the envelope will go into my "Childrens Corner" box of stamps... ... look at http://www.cddstamps.com and click on "Competition"
yes that is the same title as a few days ago but I do want to remind you there are not that many weeks until Christmas.... how fast time goes by. Also, I have posted a piece on the IPDA-News blog http://ipda-news.blogspot.com about the new Royal Mail Pricing in Proportion stamps.. really amazing level of detail courtesy of Machin Man ( Machins made Easy - Roy Simpson, another IPDA Director and his web site is in my links). Do have a look if you thought you had all the stamps.. just a few of them .. think again.. believe me you dont. I hope you enjoy this competition, have some fun reading it and researching the answers..... nothing really Christmassy this time..... something a bit different; a question for each of the 12 days of Christmas so to speak......... entries due to me by 25th December please.. in the mail so I can collect the stamps on the envelopes for my Childrens Corner supply. There will be 12 prizes as well, a surprise for everyone as I am sorting minisheets, FDCs, various assortments, packets and presentation packs. I was on the IPDA chat earlier today and had fun talking to quite a few people. I said I'd show some PHQ cards.. but as yet I have not found them. I have no idea where they went.. too many boxes to through I am afraid. Have a great week, and I do hope you get to read the Christmas competition,, Enjoy..
Something different, just because on the IPDA chat we were talking music.. there is more to life than stamps as we all know, occassionally :-) and we had a great chat about music and the bands we liked.. enjoy..
Hello, something GB for this piece, inspired by a chance converstaion I had last night. It is always good to catch up with old friends and colleagues but when gets chatting and finds out you have something in common it is even more enjoyable. During one conversation last night I found out just how enjoyable that can be. What surprises me is that we worked togther, and travelled together on the occassional long haul flight, yet never found out we both collected stamps. And what is more we both collect and specialise in GB GV. So I was thrilled last night to be talking stamps to an old friend, and as I say, am inspired to show an example of a stamp from the Profile Head issue of 1924 - 26 - because it is his specialism. 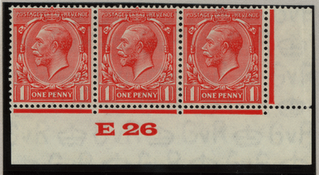 The stamps were isued with two different watermarks over the years 1912 through to 1926, with two different dies, various colour shades, two printers, and many now recorded varieties. The control shown above is from the 1924 - 26 issue with the Block Cypher watermark -(about a month ago I wrote a piece showning GB watermarks, have a look through previous writings if you want to remind yourself of these). This control has the variety "Gash in Crown" on the right hand margin stamp and the detail is shown below; just to the left of the top of the crown is a small white gash ( loooks like a while line) as correctly called, cutting through the border of the stamp. Maybe some more on this interesting issue over the weekend. I have written about some of the exhibits before but there are some new ones so have a look if you enjoy looking at stamps and want some ideas about how to prepare and present an exhibition display.